In 2014, the Conrad N. Hilton Foundation commissioned the Center for Applied Research in the Apostolate (CARA) at Georgetown University to conduct an annual survey of women and men who enter religious life each year in a religious congregation, province, or monastery based in the United States. For this project, CARA was asked to gather information about the characteristics and experiences of these women and men in a fashion similar to the survey of perpetually professed that CARA conducts each year for the U.S. Conference of Catholic Bishops Secretariat of Clergy, Consecrated Life and Vocations, which is released each year for the World Day of Consecrated Life in February. CARA designed a questionnaire based on previous CARA research on religious life and reviewed it with a representative from the Hilton Foundation. The reports linked below present results of these annual surveys. 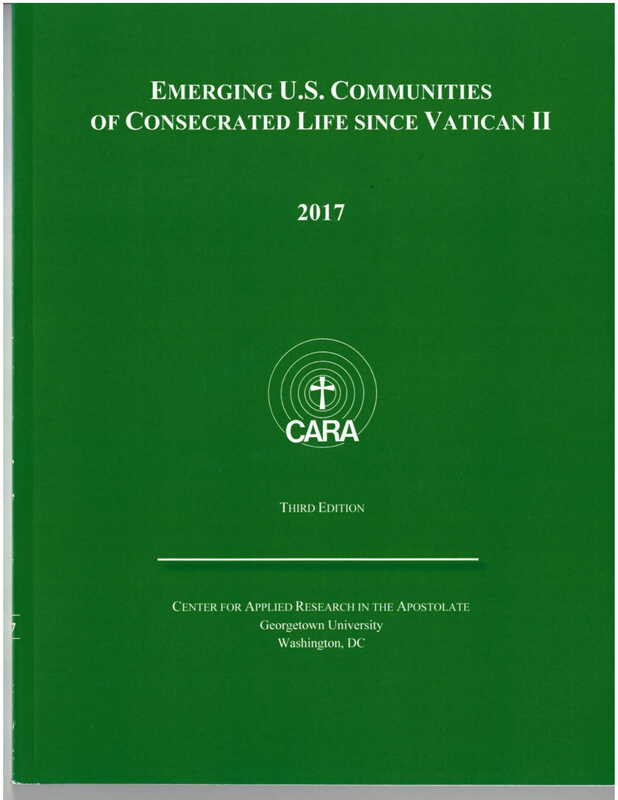 The National Religious Vocation Conference (NRVC) has compiled several CARA research studies in an easy-to-use fact sheet on vocations to religious life. 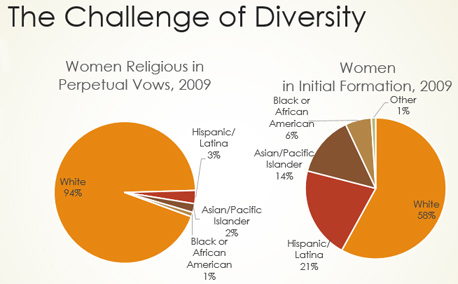 Included on this sheet are statistics on the average age of entrance to religious life, numbers of men and women currently in formation for religious life, and challenges to pursuing religious life, including educational debt, encouragement and discouragement of vocation, and changing Catholic demographics in the United States. This report presents a longitudinal study of women religious in the United States drawing on data reported by the religious institutes of women listed in the Official Catholic Directory (OCD). The contributions of women religious in the United States continue to be evident today in Catholic institutions of education and healthcare across the country, but there are, and have been, countless other contributions as well. Over the years, these valiant women have adapted to changing circumstances and forged ahead despite challenges to their way of life and ministry. The U.S. Catholic Church is indebted to the ministerial efforts and sacrifices made by women religious in the past and present. 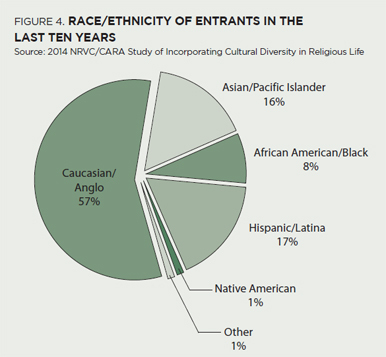 This CARA Special Report is an effort to disentangle the story of women religious in the United States that is hidden in the numbers. 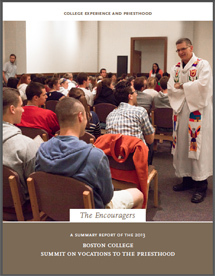 This summary report from Boston College examines the variables that promote vocations to the Catholic priesthood and calls for a more interconnected approach from dioceses, parishes, and colleges to foster them. 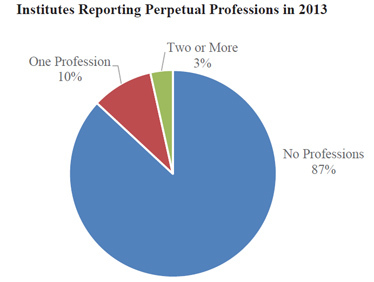 The report, College Experience and Priesthood, encompasses a CARA study of more than 1,500 men in the seminary or recently ordained, and the analysis of that study conducted at a national summit of bishops, college presidents, campus ministers, vocation directors and other spiritual directors. This book offers a comprehensive examination of contemporary religious life among women who have entered religious institutes in the United States since the end of the Second Vatican Council drawn from survey data and archival material. 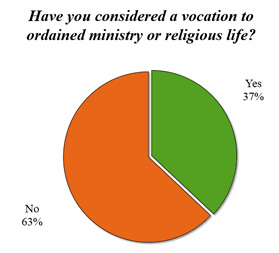 This report represents findings from a national poll of never-married Catholics regarding their consideration of a vocation. This book shares covers topics such as the challenges of ministry with fewer ordinations and larger parishes, ministering to an increasingly multicultural laity, collaboration with lay leaders, personal reflections on the sexual abuse issue, and the many satisfactions of being a priest using findings from five surveys. This report presents findings from a study of the impact of educational debt on vocations to religious life in the United States that was conducted by the Center for Applied Research in the Apostolate (CARA) for the National Religious Vocation Conference (NRVC). This report represents findings from a study of recent vocations to religious life in the United States that was conducted for the National Religious Vocation Conference (NRVC). 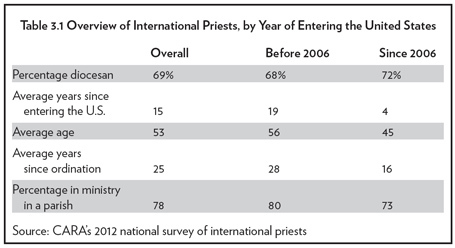 Findings were used to identify and understand the characteristics, attitudes, and experiences of men and women who are coming to religious life today as well as the characteristics and practices of the religious institutes that are successfully attracting new candidates and retaining new members.